The OCHO Peanut Butter bar has a rich, creamy peanut butter center covered in delicious milk chocolate. Made from 100% certified organic ingredients! "Have an OCHO bar and enjoy your day." Ingredients: Organic milk chocolate (organic dried cane syrup, organic cocoa butter, organic whole milk powder, organic chocolate liquor, organic soy lecithin (emulsifier), organic vanilla), organic peanut butter (peanuts, salt), organic peanuts, organic sugar (evaporated cane juice, tapioca starch), and salt. Wow, these are delightfully crunchy. My new favorite candy bar! Even if you're not a big fan of peanut butter (like myself) you should give one a try!! LOVE them! 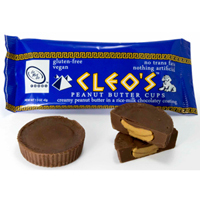 I have to agree with the previous reviewer that these are a delicious alternative to traditional peanut butter cups. Not too bad on the wallet, either! Even better than peanut butter cups! !